When one considers the history of this engine, it is hard to believe that after 50 plus years it is still being produced. Amazingly, the engine originated back in the late 1930's for powering Austin trucks. Austin had decided that they should attack the truck market with more vigor, but found themselves without a suitable engine. To avoid the lengthy and expensive process of developing a new engine, Austin blatantly copied the GM/Bedford 'Stove Bolt' overhead valve truck engine and somehow avoided the legal entanglements that could have resulted from such an exercise. The Austin engineers modified the GM engine by shifting the camshaft from the left hand to the right hand side of the engine, and designing the plugs and distributor to be on the opposite side to the manifolds. This necessitated the location of the push rods, inlet and exhaust ports and some of the head studs on one side of the head. Room was made by siamesing some of the ports. During the war the truck engine was cut down to four cylinders from the original six and used in the Austin 16, the Hampshire/Hereford and Austin Healy. It was scaled down to 1200cc for use in the A40 and still further to 803cc for the A-series engine. The A-series engine was first released as the AS3 engine and was used to power the Austin A30. It was originally planned to produce an ultra-lightweight aluminum engine but underwent many changes before the final production engine was produced. The first prototype engine was completed in March 1950 but underwent a number of modifications before reaching the final production form. 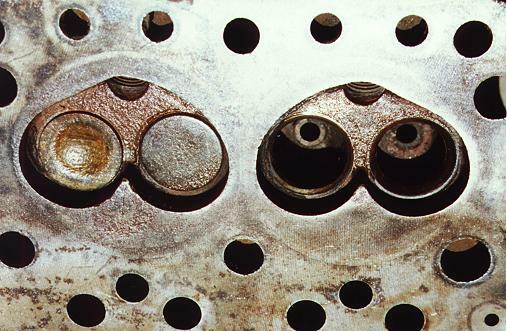 The cylinder head was designed by Harry Weslake, an independent consultant who had long worked for Austin and whose design was instrumental in making the engine combustion chambers so efficient. Early testing of the prototype showed design weaknesses in the crankshaft and bearings and it was subsequently decided to increase the size of the main bearings and the big end bearings. At the same time a new and stiffer crankshaft was fitted to the engine. Further testing of the prototype engine again showed weaknesses and the main bearings were again increased in size and the gudgeon pins were also increased in diameter. The new engine was first shown at the Earl Court Motor Show in October 1951 with the new car it was to power, the Austin A30. Not long after the Motor Show the Austin and Nuffield companies merged. At the time of the merger, Nuffield was working on a new overhead valve engine to replace the old 'lump', the Morris eight engine. The Morris eight, copied from the ancient Ford 8 engine, was too old fashioned and under-powered to continue to be used in the Morris Minor. 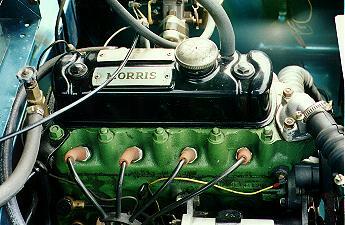 So one of the earliest results of the merger was the adoption of the A series engine for the Morris Minor. The new engine only marginally increased the power and torque compared with the old side valve engine (see table below). It can be argued that the Series II Minor fitted with the A-series engine still lacked power, particularly for the export markets, and was fitted with a gear box with poor ratios between the gears and of dubious quality. The engine and gearbox was found to be quite acceptable in England, but on the high speed autobahns and freeways found in Europe and America was found to be underpowered and unreliable. The Series II was not a significant improvement compared with the side-valve MM. Finally in 1956, the Minor was marketed with a larger and stronger A-series engine with an improved gearbox to match. Fortunately, it was decided to improve and strengthen the engine generally. The block was a new casting with bores 1 - 2 and 3 - 4 siamesed in pairs (there was no longer a water jacket between the pairs of bores). The crankshaft was redesigned with larger stiffer con rods, and harder wearing lead-indium bearings were substituted for the 803cc's white metal. Oil circulation and filtration was changed to a full flow system to prevent particles of the harder lead-indium bearing material damaging bearing surfaces. Valve size was increased, the combustion chamber was increased and the SU carburetor was increased from one and an eighth to one an a quarter inch. An improved gearbox was fitted with ratios to match the increased power and better synchromesh and a remote gear change giving a sensibly short and positive gear stick in place of the long pudding stirrer previously used. The design of Morry engines has always puzzled me. For example, take the MM side valve engine which I consider to be the last 'true' Morris engine to be fitted to the Morris Minor. It has a capacity of 918cc, a tiny bore of 57mm and a very long stroke of 90mm resulting in a bore/stroke ratio of 1.579:1. Those pistons must really race up and down the cylinders at high speed when the engine is producing it's maximum claimed BHP of 27.5 at4,400 rpm! And the stresses imposed on the bottom-end compared with a modern big bore and short stroke engine must be considerable. I had thought the bore/stroke ratio was chosen because of the antiquated British registration tax based on the bore size of the engine. 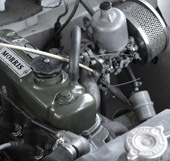 However, the A series engine developed by Austin and fitted to the Series 11 Morris Minor, was designed and manufactured after the tax was repealed. This engine also has a long stroke of 76.2mm compared with a small bore of 57.92mm (bore/stroke ratio of 1.316:1). 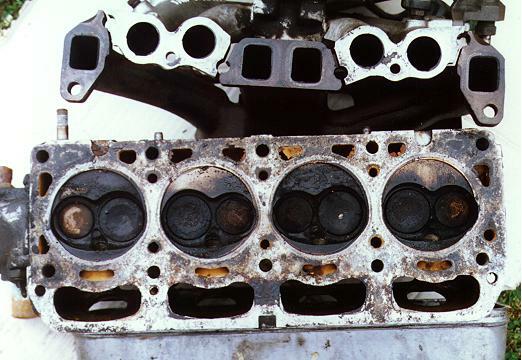 A small bore meant that only small valves could be accommodated in the cylinder head. This, coupled with the 5 port siamese twin design of the head, lead to poor 'breathing' of the engine. Another restriction of the Series 11 engine was the weak design of the crankshaft, which was often described as "a bent piece of wire with some journals ground onto it". As a matter of interest, the main rival of the Morris Minors, launched on the world market at about the same time, the VW Beetle, had a bore and stroke of 75mm and 64mm resulting in a bore/stroke ratio of 0.853:1. It was hardly surprising that the VW could cover considerably more miles without a major engine overhaul! They were designed to produce minimum power and maximum fuel economy. The design was cheap to produce. The design was chosen for production simplicity using the available boring machines. "We know best and we are going to stick to this design"!! What is the importance of bores, strokes and breathing? Starting from basics, the engine has a carburetor so as to mix fuel and air in the correct ratio. The mixture is drawn into the cylinders and burnt, causing the gases to heat up and expand. The increased pressure pushes the pistons down the bore on the power stroke. The greater the amount of air/fuel drawn into the cylinder, the greater the pressures generated in the cylinders. Greater pressures mean higher horsepower and higher torque. The more air/fuel mixture the engine can inhale, then more power it can be produced. Breathing efficiency boils down to designing an engine that will allow air to flow into the engine as efficiently as possible. A manifold with sharp bends, as in the 918cc side valve engine, will constrict the entry of air/fuel mixture into the engine. Air is not "sucked" into an engine - it is "pushed" in by atmospheric pressure. A small bore and a long stroke, coupled with an inefficient inlet manifold, is not the ideal method to attain good "breathing"! results in an engine with a poor power output for its size. 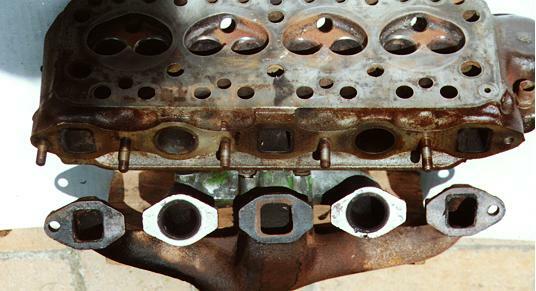 A pair of inlet manifolds connected to siamesed inlet ports that branch to a pair of cylinders is not an ideal arrangement to ensure good "breathing" and maximum engine efficiency. It should be noted that the engine was first produced during the 1950's when the demand for cars far exceeded their production rate. The UK was still experiencing shortages of materials and fuel which created a demand for small economical cars. However, by the 1960's BMC seemed to have fallen behind in engine designing when more powerful cars were beginning to dominate the market.